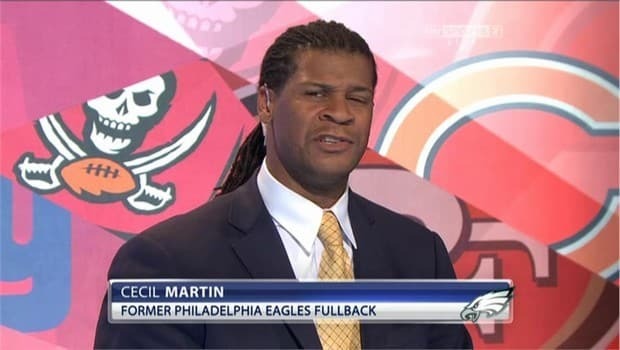 Cecil Martin is a former American football full back in the National Football League who will be better know at this side of the Atlantic for his work as an analyst on Sky Sports NFL coverage. Martin’s football career developed during his time at the University of Wisconsin–Madison culminating with a Rose Bowl victory in 1999. He was drafted as a Pro player in the sixth round of the 1999 NFL Draft by the Philadelphia Eagles. Ever-present in the Eagles 2000, 2001 and 2002 campaigns, all three ending in the team qualifying for the playoffs and remained with them until the end of the 2002 season. After spells with the Oakland Raiders and the Tampa Bay Buccaneers, Martin retired from professional football having played 61 regular season and 7 post season games across his 5 seasons in the game. Martin has won multiple awards for his community work and has been instrumental in the promotion of NFL in the UK market in both live games hosted at Wembley and also through his broadcasting activities. He is also an accomplished, motivating and entertaining public speaker. While his experiences at the top echelons of NFL are the basis of his learnings, his ability to reach out and connect with his audiences have made him a much sought after speaker. NFL, U.S. Professional Sports as well as team & personal motivation delivered through prepared scripts, Q&A or interview style presentations.